Presumably, the plan to be presented on Sunday is going to look much like the last plan, less the features to which parishioners most objected, especially the “ministry enhancements” that were priced at $425,000. Rather than wait until Sunday to comment on the latest plan, I thought it would be an interesting and helpful exercise for me to propose my own plan, which can then be compared to what will actually be presented on Sunday. I don’t have the wherewithal to put costs on each item I think should be funded by a capital campaign, but many of my suggestions will be in the parish’s plan anyway. You’ll have to guess what everything else will cost. Because I have not inspected the entire building, I will have to be just as indefinite about some items, but I will try to be as specific as possible. Fulfilling the Vision proposed to pay off the church’s existing debt, an idea that was popular with parishioners but was something of a surprise to the representatives of the Episcopal Church Foundation who did the feasibility study of the aborted campaign. Since then, our debt has been restructured, the parish having borrowed from the Growth Fund at an attractive interest rate. Any capital campaign is likely to require some short-term financing, and paying off our existing debt might require our taking on at least short-term debt at a less attractive rate. Forget paying off the debt for now. Clearly, much of the aforementioned $100,000 was intended for what can only be described as routine—and, in many cases, deferred—maintenance. St. Paul’s must get into the habit of maintaining its buildings and grounds on a current basis, financed through the normal operating fund. Putting money into a “Facilities Maintenance Fund,” as was proposed last time to the tune of $200,000, is a bad idea in the abstract and looks suspiciously like a scheme to shelter routine expenses from diocesan assessment. I hope that the Facilities Maintenance Fund idea has been dropped, though I expect to see it proposed again on Sunday. Likewise, neither outreach nor our endowment should have any claim on money raised for capital expenses. Our buildings and grounds are indeed in need of repair and upgrading, and we should focus exclusively on those needs. Below, I offer my list of worthy projects for St. Paul’s to embrace. I will try to be clear, but I will not attempt to write an essay on each one. For convenience, I will group projects that are somehow related. I will not try to rank the projects in order of desirability. It isn’t important that all parishioners agree on the relative importance of all the tasks to be done; it is only important that we have a general sense that the projects we essay are worthy ones. The order in which I list projects (or even categories of projects) is arbitrary. Moreover, I make no claim that I have thought of everything. I may have missed some significant undertakings or suggested others that might be done differently. My goal is simply to offer a checklist for evaluating what will be offered to parishioners on May 22. It is my hope, though not my expectation, that parishioners will be given a chance to modify what is being proposed. Accessibility. Put electric door openers on the door to the parking lot near the elevator and on the handicapped rest room. The door on the rest room is very hard to open, particularly if you are in a wheelchair. Provide a ramp from the door near the financial secretary’s office to St. Margaret’s garden. The steps can be replaced with the ramp. There is currently no handicapped access to the garden. There is at least one place in the church where a wheelchair can be conveniently placed during a service or other event. We should create a few more by shortening pews. It is not clear that security cameras are needed at St. Paul’s, but their use should be considered. Maintenance. Repair water damage and repaint as necessary. Make whatever permanent changes are needed to prevent future damage. (I understand that there is water damage in the chapel and perhaps in the nursery school.) The old sacristy next to the storage area at the end of the undercroft is very damp, which threatens the material stored there. This should also be fixed. Repair and stabilize our stained glass. There are broken panes, and it may be time to reset all of the glass. St. Paul’s has lovely stained glass, and we should do all we can to conserve it. There are, no doubt, other painting and wall repair to be done, as well as other minor maintenance projects. If the roof needs repair, by all means repair it. Comfort. Air condition the church. I realize that this is controversial, but, in 21st-century America, people expect their churches to be comfortable. Air condition the kitchen. How could we not have done this before? Air condition the choir room. There is currently a room air conditioner in the choir room. It is nearly useless and rather noisy. Replace the deteriorating choir chairs in the chancel. Besides being in poor repair, the chairs have a distressing tendency to fall over backwards. When the chancel was renovated and the new organ installed, there was never a plan for how the choir was to be accommodated. We are using chairs predating the renovation. Develop and execute a plan for seating in the balcony. Even less planning was done for the balcony when the organ was installed. It’s obvious, and it’s embarrassing. Exterior and Grounds. The stonework of St. Margaret’s garden is in a poor state of repair. We should fix it. We should hire a landscape architect to develop a master plan for the grounds and begin implementing that plan. The sidewalk immediately in front of the main doors is in bad repair. I would like to see the area expanded to become a gathering area for events such as the Palm Sunday service. I wrote about this and about the plan to provide handicapped access to the front door in my post “Fulfilling the Vision, Part 4.” For a number of reasons, I am now opposed to the idea of eliminating the front steps and sloping the paving in front of the church from the sidewalk to the level of the narthex floor. There are many reasons for my opposition. The main reason is aesthetic, but the idea of dropping off the handicapped on Washington Road has its own set of problems. After much consideration, I find little reason to provide a handicapped entrance to the narthex. After all, most people, whether handicapped or not, enter the building from the parking lot. There is reason to provide a handicapped exit from the narthex, however, as, in case of fire, someone in a wheelchair, say, will not have access to the elevator. A ramp could be built from the narthex door facing Mayfair Drive, but I don’t have a favorite plan for this. We need an architect’s help here. Re-engineer our outdoor sign, which is not a good advertisement for the church. (See my post “Welcome, If You’re Going South.”) We long ago gave up changing our sign with any regularity. The interior of the sign is deteriorated, the lock on one side is broken, and only one side of the sign is lit. On the other hand, the frame of the sign is quite handsome. I would like to see the sign rehabilitated and its innards replaced with an electronic sign, as is becoming common for churches to use. Such a sign can be updated from inside the building. Mt. Lebanon may give us grief about such a sign, but the fight is worth fighting, as it is the only kind of sign that really can be read from a passing car. Our outdoor banners are tacky, cannot be easily updated, and seem to come loose from their moorings with alarming frequency. Redesign or replace the brass sign on the front of the church. This brass plate has service times on it from many years ago and a place for the rector’s name. The sign should have the church’s name and the dates when it was founded and when it moved to its present location, and nothing else. That information will never change. Clean the external building surface by whatever means. Functional Improvements. Wire the entire building for Internet service and provide WiFi throughout the building. Add electrical outlets outside the front and rear of the building. These would be useful in a variety of circumstances. Replace all two-wire outlets with three-wire outlets. Two-wire outlets remain in the church (and perhaps elsewhere). This is inconvenient (and potentially hazardous) when one needs to power a device with a three-wire plug. Install a completely new sound system. Suggesting this makes me very nervous, as I am afraid we will choose a sound system oriented toward use of a church band rather than an organ and choir and the spoken word. Parishioners should ask hard questions about what is to be installed and how obtrusive that might be, either sonically or visually. Install wireless microphones in the undercroft. Improve ability to aim fixtures in the church and replace lamps. Some of the spotlights in the church that are high off the floor are unusable now because the fixtures are mis-aimed. They are difficult to adjust, and it is difficult to replace the lamps when they burn out. Some fixtures need to be replace, and it may be useful to replace them with fixtures with motors that rotate them. It may even be practical to add cat walks to make it easier to replace lamps and adjust fixtures. Replace the piano in the undercroft. Efficiency Improvements. The church uses many lamps that are power-hungry or expensive. New technologies are becoming available that will allow us to light the building at much lower cost. Aesthetic Improvements. The lanterns in the chancel should be replaced with lanterns that match the majority of chandeliers in the church. These will have to be custom made, but the “witch’s hat” lanterns are both ugly and dangerous, as they encourage heat buildup that melts the wiring insulation. Provide better lighting in the sanctuary area. The lighting in this area was never revisited after the cantilevered organ chests were added. The exposed organ pipes are now a major architectural feature of the church, yet they are poorly lit, and the areas under them are lit even worse. Additional lighting should also be provided for the antiphonal organ. Again, a significant architectural feature is being insufficiently highlighted. Add additional down light toward the rear of the nave. In the last building campaign, down lights toward the back of the nave were deleted from the project due to a misunderstanding between the church and the contractor. The rear of the church remains darker than the front. Construct some kind of partition at the front of the (liturgically) south transept to hide sound equipment and instruments when not in use. I don’t know if St. Paul’s will continue to have a band, but, as long as it does, we seem to have created an unsightly mess in the transept. Since we cannot reasonably put all the instruments somewhere else during services in which they are not being used, let’s at least hide them. Lighten the stain of the remaining dark wood in the church. This includes the doors to the narthex, some baseboard, and the front balcony wall, which may actually have to be replaced. This is, I think, a substantial list. Notice that I have not advocated spending $100,000 to reconfigure the undercroft. I have not heard a credible argument that doing so, which will reduce the amount of usable space in the undercroft, is either wise or cost-effective. If we do go forward with a capital campaign, I hope that parishioners will have some say both in what projects are a part of the campaign and just how those projects are executed. If parishioners have no say in just what the campaign is going to fund, I suggest that they do not fund the campaign at all. I was checking news from The Episcopal Church the other day and found an interesting video in a series the church is producing on healthy congregations. I decided to view this particular video because it was about Trinity Cathedral in Phoenix, Arizona, where Nick Knisely is dean. When I first got involved in diocesan affairs, Nick was rector of St. Barnabas, Brackenridge, which was a much healthier parish than it is now. We worked together on a project to connect all churches through e-mail. When St. Paul’s was looking for a rector to replace Bill Pickering, Nick was one of the candidates. The parish called Bob Banse, however, and Nick eventually moved to the Diocese of Bethlehem, where he became rector of Trinity, Bethlehem. Nick was successful in growing that parish and, after a few years, became dean at the Phoenix cathedral. Growth is kind of paradoxical. I find that churches grow inversely proportional to the amount of control the clergy are willing to give up, and the more we treat the congregation as the primary ministers of the Gospel in the world, the faster a congregation grows. Basically, our job is to equip them and get out of their way. Click on the first item in the window below to watch the video. I attended the meeting in the undercroft today after the 10:30 service presented by the diocese’s Nomination Committee that will seek candidates for our next bishop. Please see my other blog, Lionel Deimel’s Web Log, for a description of the event. 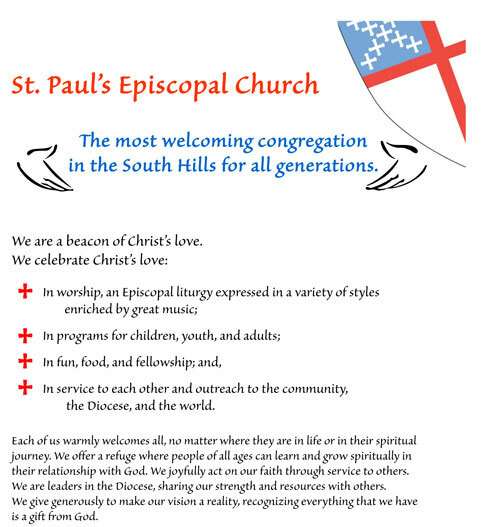 This week’s e-mail newsletter from St. Paul’s announced that, after the 8:45 service on May 22, there will be “an important informational meeting concerning St. Paul’s Capital Campaign.” Prepare for Fulfilling the Vision II. You will learn how the Vestry has responded to the opinions and concerns you expressed in last year’s feasibility study, and the plans for a more modest Capital Campaign focusing on much needed improvements and maintenance throughout the church. Come to listen, learn, and have your questions answered. In fact, the Vestry has voted (1) to go ahead with a capital campaign, and (2) to take the purchase of 28 Mayfair Drive off the table. I suspect that the new, “more modest” capital drive will look much like Fulfilling the Vision, with deletions. The brick-and-mortar portion of that proposal cost $730,000. It will be interesting to see if other items have been added to the campaign or if the items proposed last year have been modified at all. Significantly, the meeting on the 22nd is “informational.” I assume that means that we will again be told what the campaign is going to be, and we will have no opportunity to question exactly what it is we are being asked to pay for. Even if that is the case, it would be helpful for parishioners to have information about the proposal in advance of the May 22 meeting, so they can ask meaningful questions or express carefully considered opinions. Like the last presentation on a capital campaign, however, this one is likely to be depending on shock and awe. Last Sunday, Bishop Price made the annual episcopal visit to St. Paul’s and, at the 10:30 service, presided over Confirmation. No doubt, St. Paul’s was trying to put its best foot forward. As usual, I attended the 10:30 service as a member of the choir. Names of some of the confirmands were omitted. That was a shame and surely a disappointment to relatives who were expecting a souvenir of the event. One significant musical item was left out. Doug Starr sang a solo at communion, but mention of it was omitted. Another musical glitch was the reproduction of two hymns that were begun on an odd numbered page and were continued on an even numbered page. It would have been better had worshipers used hymnals for these hymns, which would not have required page turns in the middle of a hymn. It being the first Sunday of the month, we celebrated birthdays and anniversaries with appropriate prayers. Why was the celebration not listed and the prayers not reproduced in the booklet? The rector had to tell us that the birthday prayer was on page 830—“in the back of the prayer book,” he added redundantly. As usual, the congregation was not requested to read the anniversary prayer, which is also in the prayer book (on page 431). I wonder if the bishop noticed the substitution of “God” for “him” at the beginning of the Great Thanksgiving. This is a variation often made in the name of “inclusive language,” but it is not strictly proper. It is one thing for an individual to make the substitution; it is quite another for the parish to do so officially. I didn’t spend much time looking for typographical errors, but I could not help noticing serious formatting errors in the weekly calendar. A minor criticism is that times should have been right justified. Where “10:30 AM” was under “9:30 AM,” for example, the “9” should have been preceded by a space, so that it appeared directly over the “0” in “10.” The real problem, however, was that, in 54 instances, the event name followed the time without an intervening space (for example, “9:30 AMYouth Forum Lounge”). In a single instance was there the required space. Well, perhaps the bishop didn’t notice. In honor of Confirmation, we had confirmands reading the lessons. The good news is that the two readers seemed familiar with the readings and generally did not trip over the text. Both read too fast, however, and the second reader tended to drop his voice at the ends of sentences. These are common errors of novice readers, but, given that the readers had clearly worked on their presentations, it is unfortunate that no one helped them do just a bit better to really nail their assignments. Finally, I wonder what the bishop thought of the rector’s incessant stage directions (“We will now …”). I attend services at other Episcopal churches more often than most parishioners, and I almost never hear other priests giving directions to the congregation as Lou does. I’m sure the instructions are intended to be “helpful” and “welcoming,” but I know that I am not the only parishioner who simply finds them insulting to one’s intelligence. Why provide an order of service at all if the assumption is that no one knows how to read one? It is a great relief whenever I attend a service in which the flow of the liturgy is uninterrupted by unnecessary directions. If the bishop were unfazed by the usual directions from the chancel, he must surely have been taken aback by an incident that occurred at the end of communion. Because people were still at the rail after all the planned communion music was sung, Doug added “Seek ye first” as an additional communion hymn. The choir (and perhaps others who know the hymn or know how to use the hymnal index) sang the first verse. Then, in the middle of the hymn, Lou shouted out over the singing that we were singing the second verse of Hymn 711! This may be acceptable behavior in the Holy Roller Independent Fundamentalist Baptist Church in Dogpatch, Kentucky, but in a suburban Episcopal church it is simply uncouth and embarrassing. So, did St. Paul’s put its best foot forward? I certainly hope not! We can do better. We used to do better. Perhaps we can again. Last night, the day of workshops planned for Saturday, May 7, 2011, was cancelled. Joyful People: A Day of Celebration, which I wrote about last Friday—see post here—did not have enough registrants to assure its success. The cancellation is disappointing, but the decision to call off the event was prudent. Just two days ago, Bishop Price told parishioners gathered at St. Paul’s that our diocese is healthy, yet Joyful People encountered widespread indifference. What went wrong? There is probably no simple answer to that question, but we should seek to learn from what did and did not happen. For one thing, our diocese is smaller than it used to be, and expecting the turnouts typical of such events decades ago may be unrealistic. A smaller diocese also means that there are fewer hands available to keep the diocese running, and those hands may be somewhat overworked and therefore inclined to skip an event now and then. The timing wasn’t ideal. Early May is a busy time, and, this year, it comes just after Holy Week, Easter, and a visit from the presiding bishop. Perhaps the biggest problem was that there was insufficient publicity, and what there was did not appear early enough. A parishioner at St. Paul’s without e-mail had no way of knowing the event was scheduled, and even those with e-mail had to have been signed up for the diocesan newsletter to learn of the workshops, since no mention was made by St. Paul’s at all. People could have visited the diocesan Web site, of course, but how many folks who do not receive Grace Happens actually do that on a regular basis? More publicity would have required more labor, and, as I said before, our diocese is smaller than formerly. In retrospect, however, probably much more public relations work was needed. Many of the workshops were specialized, such as the one aimed at altar guild members. For such workshops, targeted advertising was required. Well, even successful organizations are not successful all the time. Perhaps lessons learned from the Joyful People experience will help make the next day of workshops (or perhaps some different event) a bigger success. I do believe out diocese is healthy—but it isn’t perfect. 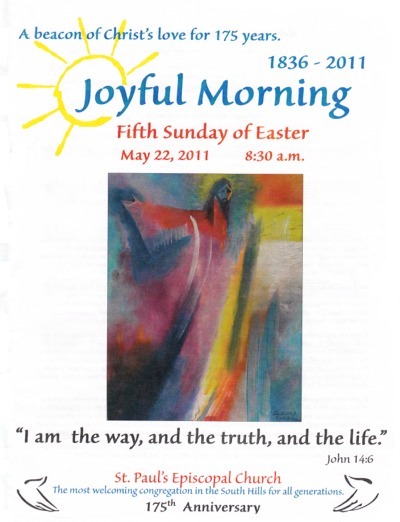 Update, 5/7/2011: I am told that Joyful People has been postponed, rather than cancelled. I think this means that the diocese, at some point, will sponsor a somewhat similar event. I don’t know when that will be, and it will assuredly be an event with a different set of options. I look forward to attending Joyful People II. Ironically, today I received a check from the diocese refunding my registration fee for Joyful People.